With the dawn of cloud, the nuances of IT infrastructure have been instilled with a wave of fluidity and convenience where mission-critical components, such as policies, processes, equipment, data, human resources, and external contacts, work seamlessly for overall effectiveness of business process. Emerging technologies such as virtualization, SDN, and the trend towards web-scale IT are helping enterprises to create the agile and flexible IT infrastructure to meet the changing demands of the customers and the market. Many businesses are embracing these technologies to drive their cloud and virtualization initiatives, and to reinvent the traditional models that manage IT operations through manpower and static tools, and prepare themselves for the better business opportunities. Cloud is certainly the key facilitator for dynamic, responsive virtual network infrastructure, as it has already transferred traditional IT to deliver scalable, cost-effective and flexible solutions, regardless of the myriad debates on se­curity issues. 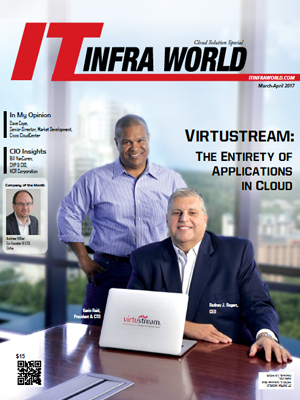 Cloud infrastructure is solely based on virtualization, where mul­tiple resources appear in a single repository—improving the network perfor­mance, ensuring information flow is processed in an undisruptive way among the users, as well as meeting the organizational requirements both in speed and reliability with less operational cost. A distinguished panel comprising of CEOs, CIOs, VCs and analysts along with the editorial board of IT Infra World has selected the Top 10 Cloud Solution Providers 2017. The listing provides a look into how these companies are helping clients build flexible and secure infrastructure with cost-effective cloud solutions.